Hey everyone, how are y'all doing today? I am great!! I decided to change the background of my blog. I really liked the black because it made everything POP, but I have had several readers (and my husband) say that it hurts their eyes. I decided to change it to a white background and I will most likely change the background of the cards too. So what do you think? My friend Kristine gave me a ginormous box of pattern paper and I found both of these in there. 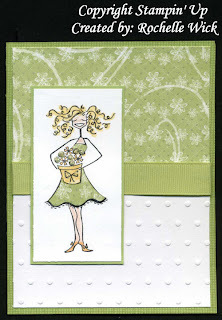 I stamped the Bella on the celery pattern paper and cut the dress out and pieced them on. Super easy and I love how it looks. The white actually came embossed with the dots. How cool is that? I got the celery 5/8 inch ribbon at the fabric barn. I really am lovin' the 5/8 inch ribbon. And of course I had to add stickles on the flowers. Don't-cha love stickles? I didn't put a greeting on this card. I will wait until I am going to use it and then put one on. I find that works good for me. I hope you all have a great day and I will see you tomorrow with a treat box for Hershey kisses. I had never heard of a gate fold card until I got my Scor-Pal. There are several different fold directions on the back of the packaging. It is a very cool looking card and fold. The challenge to keep it closed is the only tricky part. Some people close them with ribbon. I closed mine with magnetic closures from Basic Grey. They are thin enough to not bulk up the card. I hid one of them under the pattern paper and the other one is behind the scallop circle so when you close it is snaps closed. You can get two of these cool cards with one sheet of card stock. Cut paper 5 1/2 x 8 1/2 and score at 6 1/8 and 2 1/8 on the 8 1/2 inch side. So when it is closed it is 4 1/4 x 5 1/2. I cuttlebugged the solid side of mine. Super cute ha? I thought it would add some dimension and it matches the dotted paper real nice. "Please Read, Your Feedback Requested!" I have enjoyed assisting everyone on this blog with finding those “hard to locate items” that I like to use in my projects. Therefore, I have been giving some thought to starting an on-line store in order to assist you, my friends, even more. 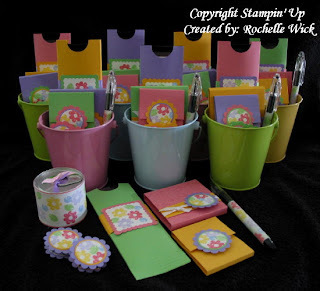 I would post the option for crafters to buy such items as stickles, tacky tape, ribbon, clear boxes and envelopes, cuttlebug embossing folders, alterable items such as CD/DVD tins, containers, glass bottles, etc. Eventually, I would also like to offer the option for my readers to buy stamps. Based on feedback, I could offer up just about anything that my readers would enjoy! I could also offer kits for sale so that you may create some of the same items that I enjoy making, such as the beaded pens. I would offer all the items you need to make the pens, or other projects, so you wouldn’t have to go to several different stores to get the supplies yourself. Some other ideas would be kits you could do for your classes. I would do all the prep work for you and send a sample of the project, and you would merely need to demo it. So what I’m asking of everybody on this blog is, please give me your opinion if this would be a valuable service to you. I would appreciate it if you would respond to me with your comments as to whether or not you think you would like to use such a service. You could either email me directly or post a comment as to what services and products you think you would enjoy me supplying. I know some people do not enjoy going to numerous stores to find those products they would need for a single project. I would like to make things easier for you, and give you the option of one stop, or one click, shopping. I have just begun doing the research, crunching the numbers, etc. to see if we could make a go of it. I wanted to put a feeler out there to see if people would be interested in what I could offer. I get e-mails every day from my fellow crafters that are inspired by my projects, and I enjoy helping every one of you. Some of you live far away from the Target's, the Michael's and the Joann's. 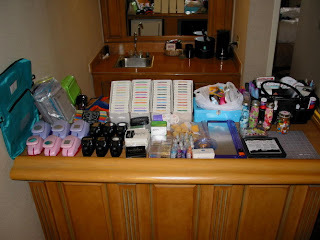 I could provide you a place to get it all in one shot, and you don't even have to leave your house! How great would that be?!? I would be your supplier and shipper, all in one. Please leave me some feedback, even if you feel you would not need this service. Thank you so much for assisting me in this project, and I look forward to hearing from you. I got to spend an hour with Tim Holtz on Saturday!!! He is a very funny, talented hottie! He was at my local stamp store all day Saturday. He did demos all day long. We did a make and take bracelet with his grunge board. We colored it with his paints and then doodled with a white gel pen. I love how mine turned out. We had several colors to choose from. Then we went in the classroom and sat with him and he did demo after demo after demo. He is super funny and real cute. His talents blew me out of the water. I had never tried his inks before. I am now a fan and I am for sure going to get some. I loved everything he did. I think I might have missed some stuff though, I couldn't take my eyes off him. Did I mention he is a hottie? The lady in the picture with Tim is Carol. She owns the stamp store. 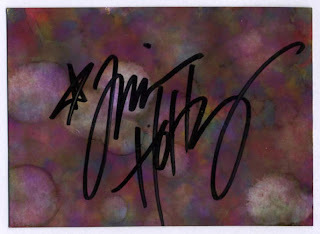 He even made me a cool thing with his alcohol inks and glossy paper then he signed it for me. Woo Hoo!! Is this cute or what? My friend Nancy showed me one that she had and I just had to make some too. I made this out of a clear SU envelope. 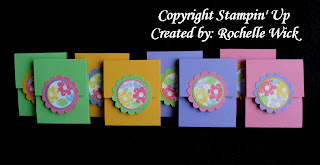 * Here is a video tutorial that Nancy sent me for these. * They are pretty easy to figure out though. It is held closed with a Velcro Dot. 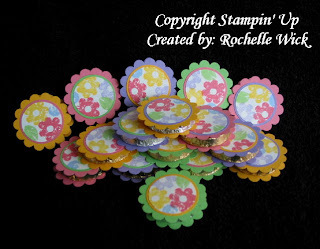 The circles were made with the Creative Memories Cutting Tools. First I scored the envelope and put the candy inside and sealed the envelope. After I cut the circles and glued them together I scored them in half and folded the circles. Then put a strip of Scor-Tape on the opposite side of the sealed envelope and adhered it to the inside of the circle. Folded the envelope and added a Velcro dot to keep it closed. I hope that makes sense. 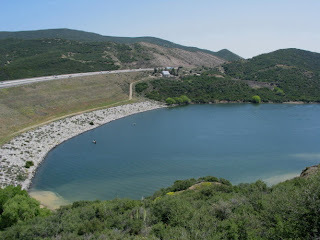 Here is what it looks like when it is opened. This will give you a better idea on how it is put together. 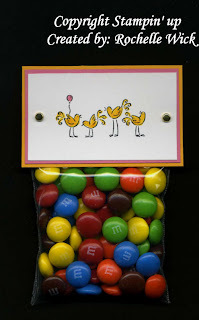 They are a cute easy treat to make for a thank you or what ever. Another Nancy Hill inspired item. 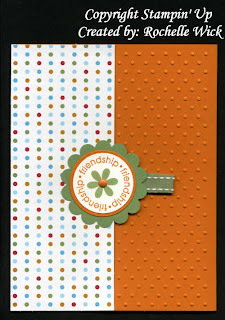 Nancy got this card (with different colors) in a swap she did at stamp mania. I loved it so I had to case it. I wanted to make several of them to use when I need a quick birthday card, but would you believe with all the paper I brought with me to LA I only had 1/2 of a sheet of rose red? Yeah, me neither. I use that color all the time. Sure enough when I got home I found my pack of rose red just sitting there. The frosting on the cake is a SU scallop punch that I cut to fit the top of the cake. Then I rubbed the frosting with versamark and covered it with iridescent ice. You can't see it very good in the picture but in real life it is shiny. Also the blue stripe is crimped. I don't think you can see that very well either in the picture. 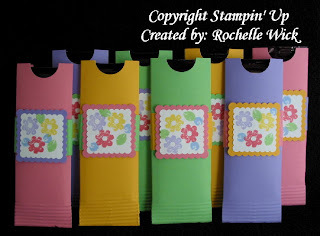 My friend Nancy made similar jars like these for her door prize at stamp mania. Nancy put rub ons on the sides of her jars. I thought they were super cute and I had to make my own. 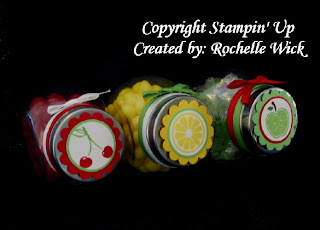 For the candy, I used cherry sours, lemon sours and green apple hard candy for mine and used the matching stamps for the tops. I really love how they turned out. Don't know who is going to get them yet but I had to make them. The box movie candy that you can get at Walgreens fits perfectly in the jars. But you could put practically anything in them. Here is a close up of the lids. I colored the images with SU markers and punched them out, matted them and that was it. Then I wrapped ribbon around the lids and used a glue dot to add a separate bow. I also attached the paper with glue dots to the lids. Where can you get these cool jars to decorate you ask? You can get them at Cost Plus World Market. They come in a 4 pack for $3.99. Yes, $3.99. With tax they come to around $1.15 each and when you add the candy it will cost you around $2 per jar. How is that for a cheap cute gift to say thank you or for a quick birthday treat for one of the kids in your kids class. You could also make them for a hostess gift, club project, or teacher gift, the possibilities are endless. The jars come in two different types, round and cylinder. Get the round jars, they have the flat sides and they lean forward. I also heard there are similar jars at Hobby Lobby for 99 cents each and some at IKEA. This saying cracks me up. I made this last weekend. I don't have this stamp but my friend Kristine does. She has a ton of Cornish Heritage Farms stamps. She is also on their design team. 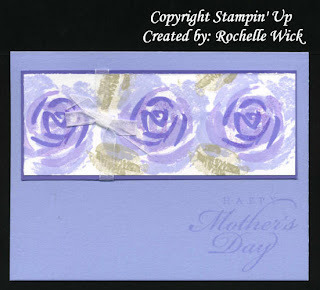 I love to stamp with her cause she has so many more stamps than I have and a lot of other companies. I thought this little guy was the cutest. The branch is already a paisley print and I think that makes it look cool. Because of the colors I picked I also didn't have to color the owl. I think he looks good just how he is. Sorry, my card is a little crooked too. But it is still cute. 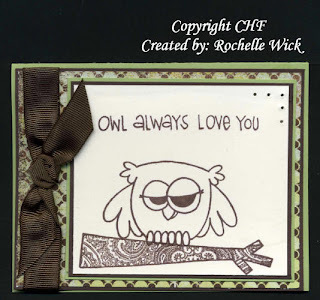 Here is one of the cards I made last weekend with my new stamps. 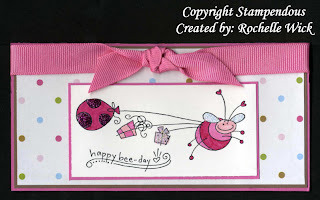 I got the Bee stamp and the greeting from Kristine. I think this bee is one of the cutest stamps. It makes me giggle. I found the paper at my local stamp store. I don't know who makes it though. The ribbon is some that I got at the Fabric Barn. It is pixie pink 5/8 inch grosgrain. Or course I had to add stickles to my bee's wings, balloon, and present. I love stickles. I also love the look of the long card. 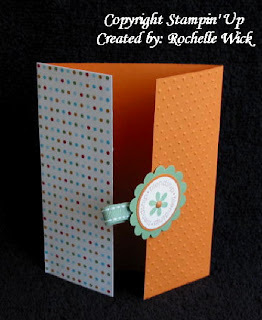 It is 6 1/2 x 6 1/2 and fits in the Stampin' Up's open ended envelopes. The only downfall with the long card is that you can only get one per sheet of paper. But that doesn't stop me from making them. Here is what I brought with me for this weekend. Yeah, it was a lot and most of what I own but I did end up using almost everything I brought so that makes it all worth it. Plus everyone else used the stuff I brought too so it all worked out. Friday the four of us (Kristine, Nancy, Margaret and I) met at the Fabric Barn around 3:00 when I got to town and we tore that place a part. I got 25 yards of 10 different colors of 5/8 inch grosgrain ribbon and 80 yards of 10 different colors of 1/4 inch grosgrain. All matching Stampin' Up. Woo hoo! The 5/8 inch ribbon is 5 yards for $1 and the 1/4 inch ribbon was 8 yards for $1. Great deals. We stayed up until 2:30 Saturday night stamping and talking. I did more talking than stamping though. I only made one card. LOL I know, that is so bad. But I made up for it Saturday. After the stamp mania and dinner, Kristine went home and Nancy, Margaret and I stamped until 12:00 and I got a couple more things done. Then after they left, I so wanted to go to bed so I jumped in bed and tried to fall asleep but I just couldn't, I ended up getting back up and stamped until 3am. It was fun but I paid for it Sunday. I set my alarm for 9am but I woke up at 6:30am I managed to fall back asleep until 8:30. I ran down and got breakfast and brought it up to the room. I stamped for a couple more hours before I had to put my stuff away and head home. It was a long 7 hour drive cause I packed my I-Pod. I thought it was in the glove box but it wasn't. Oh well. I brought WAY too many stamps. I only used a few of them, but you never know what you are going to want right? Last year I didn't bring this many and I used something from each set. I guess I just wanted to be prepared. It was such a good time though. I wish I lived in SO Cal. I could get together with my friends a lot more than once a year. Next time I am going to plan better and know what I am going to use as far as stamps ahead of time. Here is the paper I brought. The brown box is 12 x 3 or 12 x 4 and full of pattern paper that Kristine gave me. Thanks Kristine! I used several sheets from it already. Some SU but mostly other companies. I can't wait to look at it better and see what else is in there and what I can do with it. I had a great weekend with the girls. Not long enough though. Lots of laughs, shopping, and stamping. It was fantastic. I will post projects tomorrow. I also had several requests to change my feed to full so people could see the entire post with google reader. Here you go ladies! I always crack up when I go to LA. Some random things are just funny. Like the random dust tornado's in the middle of no where. I saw at least 10 of them. Literally in the middle of no where. I also think that the tumble weeds that are half the size of Volkswagen bugs are funny when they cruise across the freeway, the single oil well in the middle of the city of Burbank. It is a couple blocks from the High School right down main street. It totally doesn't belong there. I also like the bases of the signs in the freeway in LA. They are lined with barbed wire so that the taggers can't spray graffiti on the signs, Oh and another funny thing is that people carve their graffiti in the side of the dirt hillside through the canyons. I love the drive cause it makes me laugh. Good times. I do have more pictures and I will post them later today. I wanted to post something today but all my stuff is packed and I couldn't make anything. And I'm sure you don't want to see all my 1/2 finished projects. I hope that I have internet in the hotel so I can post some updates and pictures for you this weekend. Otherwise, I will be back Monday morning with lots to show and tell. Woo Hoo!! You all have a great weekend too! See you soon! Look what I found at Joann's. 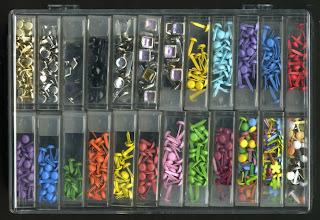 It is for storing beads but I am going to store my brads in. It was $5.99 It is perfect. Before I used a bunch of baggies. I am almost done packing for this weekend. Today I am starting to pack for LA. This is my 4th stamp mania. I can't wait. I am leaving Friday morning at 7am. LA is a 7 hour drive for me. I love the drive though. It is mostly one freeway so it is easy. It is also a very beautiful drive. Mountains, vineyards, and orchards practically the whole way. I plug in my I-Pod and sing the 80's as if I was in the band. I just downloaded Monster Ballads and I can't wait to hear them again. Remember Cinderella, Warrant, Firehouse, Winger, Kix, Europe, and Foreigner just to name a few. Last year, I lost my voice a little singing on the drive down. I don't care who sees me singing my heart out. I don't get embarrassed about that. You are going to die when you see all the stuff I bring with me. You would think that will be stamping 24 hours straight with all the stuff I am bringing. Friday I am meeting some of the ladies at the Fabric Barn then we are going to the hotel to stamp all night. The fabric barn rocks. I think there is about 12 bolts of fabric and the rest of the store is wall to wall ribbon. 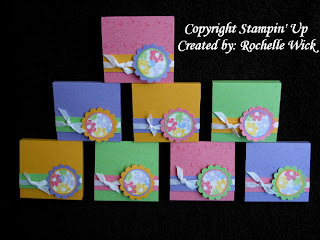 All match Stampin' Up too. Oooooo I can't wait. I am getting more excited as I type. I didn't stop at the fabric barn last year cause I still had a big bag of ribbon. I still have a bunch left but I need some new fresh colors. Saturday's event is from noon until 9pm. Stamping until 6 then we go to dinner at the same Italian restaurant. They have a buffet for us. Good food, good friends, and good times. I will try to post something later today. Right now I need to get my crap together. Can you say crap in a blog? LOL Have a great day everyone. Here they are!! Woo Hoo!! I found these matching tin buckets at the $1 spot at Target. They didn't have purple so I got blue instead. They all match so it is ok. I love the mix and matching thing I have going on with the colors too. I thought it would be fun to have all the colors in each set as opposed to all the same colors. What do you think? I know that they are going to like them as much as I had fun making them. Here are the links to the directions for each project, except for the chocolate coin sammiches. Those you just put together with a glue dot. 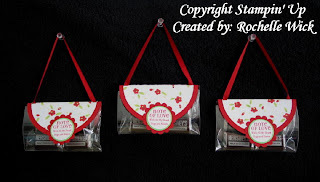 If I have inspired you in any way to make a gift set or any of the items that you see on my blog, please e-mail me the link to your blog or scs gallery, I would love to see what you made and comment. 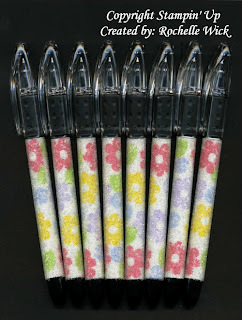 Here are the beaded pens for the gift sets. Some of you have problems with the beads coming off of yours when you make them. That happened to me too at first, until I discovered the secret. Heat! That's the secret. After you put the tape on, use the heat gun for about 15 seconds and heat up the tape and then roll them around in the beads. After the beads are on, I roll the pen with some pressure on my cutting mat so really get those beads stuck in there. I did a tutorial a couple years ago that I posted on SCS that has step by step directions with pictures, you can find that Here. The only thing that I do different now, is I buy the tacky tape sheets instead of using the tape roll and cutting my strips. I get the tacky tape sheets at Oriental Trading Company. You get 3 8 1/2 x 11 sheets for $4.95. It is a super deal. My local stamp store used to sell the sheets but you only got one sheet for $5. If you have any questions, feel free to shoot me an e-mail I would be happy to answer your questions. Here are printable directions for you for the pens. I want to tell you a cool story that happened to me. When my parents were here I had to pick them up at the airport in San Fran. Before the Bay Bridge you have to go through the toll booth. Where 18 lanes of traffic turn into 5. Yeah, it is unreal. Anyway, when it was my turn, I drove to the gate and the guy said, "go on, the car ahead of you paid your toll." I was completely caught off guard. How cool is that. A total stranger paid my $4 toll. It really makes you believe that there are good people out there. So the other day I wanted to pay it forward. I went through the Starbucks drive though and I bought the coffee for the lady in the car behind me. I wanted to catch someone else off guard and make their day. She gave me a honk as she passed me when I was at the light. Let me tell you. That $3.65 purchase made me feel good all day long. I was letting people go ahead of me at stop signs, and at the grocery store, I even let those annoying people in that wait until the very end to get in the lane from the on ramp on the freeway. That usually makes me mad, but nothing could make me upset that day. I just felt great all day long. So why don't you find someone to pay it forward to. It really makes a difference, for you and for a complete stranger. 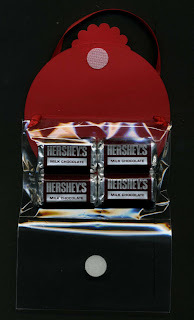 "Gift Set Wrapped Hershey Bars"
Are you getting tired of this gift set yet? Sorry I am almost done. I only have one more item for it to post. Beaded pens, which I will show you tomorrow. As you know, I can't make a gift set without making a wrapped Hershey Bar. It's kinda my signature thing at school. I love making these. I am going to LA next weekend for the Splitcoast So Cal Stamp Mania 5. I can't wait. Some of us will be stamping in the hotel room Friday night so I should have some cards to share. Providing I don't talk as much as I usually do. LOL I can't wait until next weekend. You will laugh at me when you see how much stuff I bring with me. Pretty much everything I own. I don't even let the maid clean the room on Saturday cause I don't want her to have to move anything to clean the room. I always make the her a little bag of treats as a thank you though. Usually a couple bag toppers and a wrapped Hershey bar. Here are the directions for the wrapped Hershey Bars. Here are some more treats for the gift sets I am working on. These are cute and all but as I am making them I realize that even though they are super easy to make, it is a lot of work for one small piece of candy. Oh well, it's all about the packaging right? Here is where you can find the directions for these. These gift sets are going to look cool. I found some $1 tin buckets at Target in matching colors so I can put everything in them. They didn't have a purple one so I got light blue. Two more items for the gift sets and then I will post the completed sets. Here is what the inside looks like. I found those new Hershey Bliss Chocolates to put inside. I don't eat much chocolate but these are very good. Real creamy. I love making these little sammiches. Usually I make them with the York Peppermint Patties but I found these chocolate coins the other day at Walgreen's and I like them a lot better. They come in those little mesh bags. They are thick like the peppermints and the tops are hard as opposed to the peppermints, so when you stick the top on you are not squishing your finger into the top of the candy. 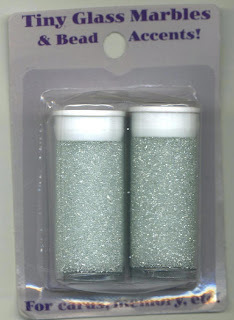 Also because it is flat the glue dot seems to stay on better than on the peppermints. I made these for some gift sets that I am working on. The colors are so springy. 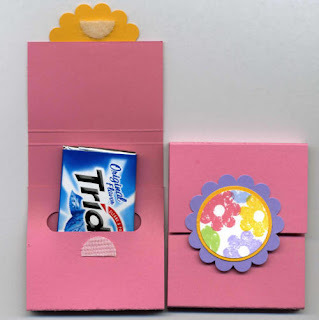 I love making the gum holders, they are so fun. The only downfall of them is that they make the whole gift sets smell like what ever kind of gum you use. 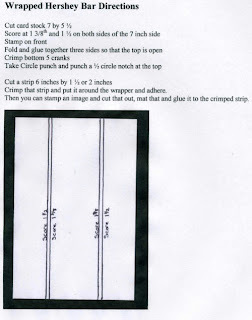 Here are the directions for making the gum holders. 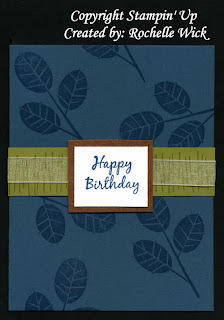 I made this card this morning with my new embossing folder. It is called Swiss Dots. I love this one. 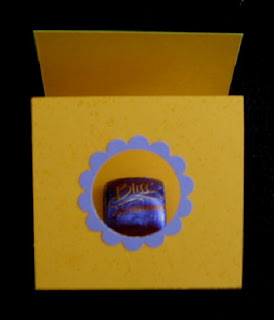 The greeting is a Studio G clear stamp that I got from my friend Shelly from MN. I think it works great with this cute little birdie. Of course I had to add stickles on the flowers. I also didn't want to add a third color so I did the pink scallop and added the white dots to make it not so pink. You know what I mean. I also popped it up on thick foam dots to give it nice dimension. SU dimensionals just wouldn't cut it. I ended up finding the candles at the Dollar Tree but they weren't the ones I was looking for. I didn't want the pillar ones, I wanted the ones with a flat top cause I wanted to wrap them with ribbon. Oh well, they still worked. Remember paint prints? I like to use this set for the candles. I think that is pretty much all I use that set for anymore. My class went great. They all had fun. We kinda ran out of time and went over a half hour. But everyone got all the cards done so that was good. The card with all the word window punches tripped a lot of people up so next time I will either leave the off the "extras" or have them punched already for them. It is still a learning process for me as far as timing goes. Yesterday I bought a cuttlebug so now I don't have to use my sizzix anymore. Be prepared to see a lot of cards with the embossing folders again. I can't wait to play with it. I also got a new embossing folder and I can't wait to use it. 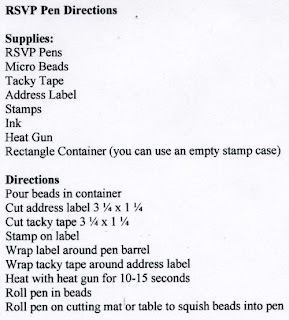 Here are the directions for the stamped candles. I am pretty sure that I posted one similar to this before. 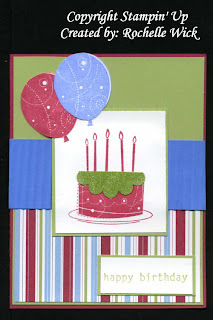 This is the masculine birthday card that I am doing tonight for my class. As soon as I am done posting this, I have to run out again to try and find candles. I want to do a stamped candle and I have been having a hard time finding the candles. I used to get the unscented ones at Michael's for $1 but they don't have those any more, now they have white scented ones for $1.50 and I don't want to pay that. I need 12 for the people in the class and one for my sample and one to demo and I guess a couple extra in case. So I don't want to buy 16 of them for $1.50. Nothing like being last minute ha? I went to the dollar tree yesterday and they had two of the ones I want so I am going to go to the other dollar tree and Walmart to see if they have them. Otherwise I will have to get the $1.50 ones. Here is a card I came up with this week for my class. I noticed that 4 out of the 5 cards I had prepped for the class were birthday cards. So I had to come up with two different cards. Here is one that I did. I am going to give them the choice to either make it as a Mother's Day card or they can use the greetings from sincere salutations and make it something different. You can't tell in the picture but there are stickles on the flowers. Not my favorite card for the class but I think they will like it. 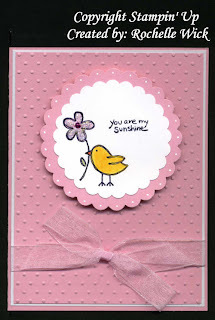 I got this super cute Bella RAK this week from my friend Melissa Ferr I love this card. Great colors and I love the ribbon. The oval is punched out of the front of the card and the Hello is on the inside. Hard to tell in the scan. Thanks Melissa for the great RAK!!! I was tagged again the other day by Adela. 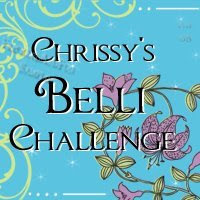 Check out her blog if you haven't already. I have to list 7 weird random things about myself. Hmmmm.... What don't you know about Rochelle Wick. 3. I am a HUGE baseball fan. (Go Twins!! )&(Go Yankees) I have loved the Yankees since I was little but I am also a die hard Twins fan. 7. I LOVE LOVE LOVE a good thunder storm. We don't get thunder her where I live. In the past 4 1/2 years that we have lived in CA I have heard thunder 6 times total. When we lived in MN I looked forward every year to the July thunder storms. Here is one of the 3D projects that I am doing for my class. I don't think they have done a bag topper before. 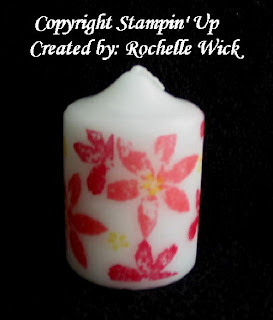 The other project I am going to do is a stamped candle. I have to get the candles today. I totally forgot all about them. I am almost ready for my class on Friday. There were two people on the waiting list so I added them to the class. So now I will have 12 people. I am excited. I have all the cards prepped for 30 so I should be safe. 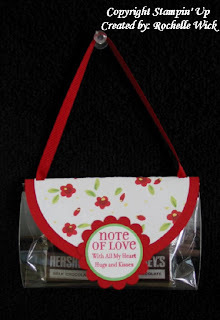 They will be making one bag topper and one candle to total 12 projects.